LONDON – Over the last five years, coffee shops have spread across the UK like warm frothy milk rippling across a latte. Counting all the locations of Caffe Nero, Costa, Greggs, Pret A Manger, Starbucks Coffee and Wild Bean Cafe, there are now more than 5,000 major coffee shop branches in the UK, according to the Local Data Company. Costa, the UK’s largest coffee shop chain, has more than 1,500 stores, more than twice as many as the 658 it had in 2010. Greggs, a bakery chain that has started to increase its focus on its coffee offering, operates in 1,621 locations around the country, up from 1,269 five years ago. Wild Bean Cafe, which is found at BP service stations, has grown from just 11 stores five years ago to 288 today. There are a similar number of Pret A Manger locations, an increase of around 50pc from 2010, while Caffe Nero has boosted its presence by 44pc to 508 branches and Starbucks has grown by a fifth to 719 locations. Andy Harrison, chief executive of Costa-owner Whitbread, has attributed the coffee shop market boom to the growth of female spending power and the rise of online shopping, with people meeting friends for a day-time snack instead of hitting the shops. He said last year that the coffee shop market grew by 5pc a year throughout the recession even in the most economically challenged parts of the UK. Meanwhile, pubs have been struggling to keep up in the face of high taxes and are closing at a rate of 29 per week, the Campaign for Real Ale said this summer. Establishments that do not traditionally serve coffee are increasingly turning their attention to the hot beverages, with pub chains such as JD Wetherspoons attempting to triple its coffee and breakfast sales and McDonald’s promoting the “McCafe” and selling more cups of coffee in the UK than Starbucks. Traditional coffee shops are capitalising on this growing coffee culture, too. Today, Costa opens its first Fresco store, which aims to create a more upmarket, food-oriented coffee shop atmosphere. Starbucks has already tried this approach, serving £6 coffees and glasses of wine and opening late into the evening. The map also shows where each coffee chain store is likely to be located. Pret A Manger is overwhelmingly clustered in London, while Wild Bean Cafes tend to be located in the Greater London area, around Edinburgh and Glasgow and on the major roads out of these cities. Starbucks can be found in the larger cities while Greggs has a stronger representation in south Wales, north England and Scotland. 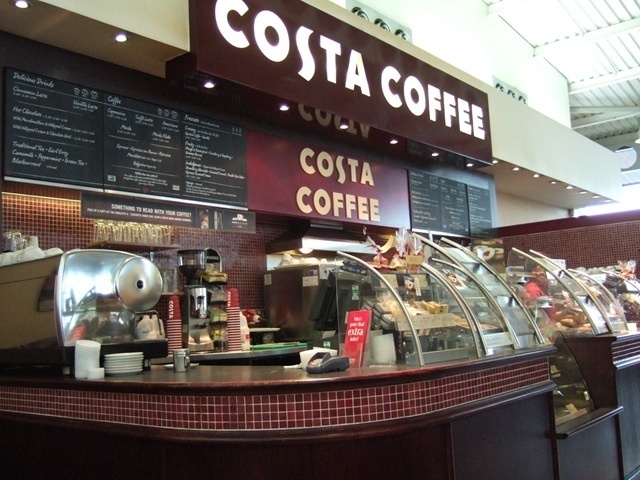 Costa has a largely even spread across much of the UK, reaching into such far flung corners as Elgin in northern Scotland, Pwllheli on the north-western peninsula of Wales and Penzance in the tip of Cornwall.